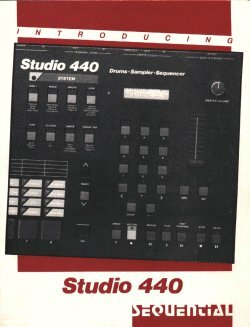 Studio 440 brochure by S.C.I. I have OS v2.30+ from Point Source, which truns the Studio440 into a Plus version. It has now the scuzzy port activated. I've tried to hook up a Syquest 44Mo. It works ok. You have 100 locations on the cartidge to save 100 disks, sounds or sequences. I even try it out with a Zip and no problem ! But always only 100 drives locations free. It's 60% waisted with a Zip cartidge. Anyway saving and loading times are pretty much improved, only 5 sec ! I've changed the floppy drive on my 440. I had it replaced for a Roland floppy drive, ref CHINON RZ-354 for Roland MV-30, and it works great, even faster than the Sony factory drive. The Chinon is a little smaller and thinner than the Sony. I had no problem with underneath screws to attached the drive to 440's chassis. I cut a little pice of thin black plastic sheet, got some double sided rubber adhesive tape, and glued the sheet on the top of the gap left by the drive. This is quite fine and looking good. The chinon is even quiter than the Sony. Highlt recommended. Originally designed for Roland MK-80 (not MKS !!) digital piano. It's a 2 lines by 16 chars, and features +5V green backlight !! It looks really great. Dissasemble the old LCD is easy, simply unscrew 4 nuts, and unplug the connector. Then you can replace the LCD using larger washers. But before assembling, you'll have to do a little wiring job here ! You have to cut down the Roland's connector, and cut the old LCD cable with connectors at both ends in the middle part. Now you should have your new LCD unit with free wires, and a half part of the old 440 display cable+connector. Strip ends of each wires, and get ready for a good soldering party ! "here you can read the lcd reference, reversed..."
NOTE : wires #14 & 13 are black. As you can see, you'll have to change the pinout !! Now get ready for tuhe smoke test ! Should do it. bonus : the 440's contrast pot even works after this modification ! The following are tests routines for Studio440. I hope this will help some !! be basically running in the first place. 2. Hold down both the INC and DEC switches. key pad) should display the switch name in the LCD. the test number on the ten-key pad. of FFH. But It Is probably better to let the player adjust this empirically. This test has a similar display as #4, but tests the pad comparator action (not ADC). require only a feather-touch on the pads to trigger the comparator. While In progress, displays "ZERO SAMPLE TEST, SAMPLING...". the sampling circuitry following the analog switch which selects the Input filters. In progress, displays "TESTING SEQUENCE RAM". 1 – READING” then pass 2 writing and reading. from directly entering the next test. Note: This test is only available In software level 1.3 and up. In progress, displays "SAMPLE RAM REFRESH TEST". When finished, display Is the same as test #2. 1. Connect MIDI IN to OUT A. After test, It reports OUT A passes or falls. 3. To continue, press TAP again. 4. This time, connect IN to OUT B. It reports OUT B pas or falls. Same as #7, except just connect the TERMINAL/SYNC OUT to IN.